Milwaukee, WI — The Milwaukee, Wisconsin based trial and litigation law firm of Gimbel, Reilly, Guerin & Brown LLP (GRGB) is pleased to announce the addition of Attorney Kristen N. Nelson to the firm’s Health Law Section. Nelson, a 2012 graduate of DePaul University College of Law, has joined the firm after working in private practice specializing in criminal, civil and regulatory representation of health care providers. Kristen is licensed to practice law in Wisconsin and admitted to the Eastern District Court of Wisconsin and the Seventh Circuit Court of Appeals. She is a member of the American Bar Association, Wisconsin Bar Association, Milwaukee Bar Association, Association for Women Lawyers and the American Health Lawyers Association. 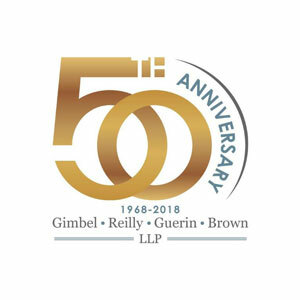 Milwaukee, WI — The Milwaukee, Wisconsin based trial and litigation law firm, Gimbel, Reilly, Guerin & Brown, LLP (GRGB), is proud to announce that the firm is celebrating its 50th Anniversary in 2018. In 1968, after arguing some of the most high profile cases of the time as a federal prosecutor for the Eastern District of Wisconsin, Franklyn M. Gimbel founded the firm. Frank’s late brother, Stanley P. Gimbel, joined the firm a year later followed by former federal prosecutors Richard E. Reilly and Thomas E. Brown and former Department of Justice Special Agent D. Michael Guerin. 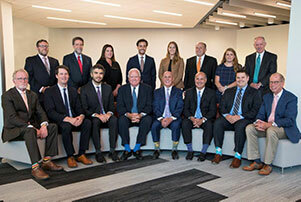 Milwaukee, WI — The Milwaukee, Wisconsin based trial and litigation law firm, Gimbel, Reilly, Guerin & Brown, LLP is proud to announce that eight of its attorneys were named “Best Lawyers” by MKE Lifestyle, previously known as M Magazine. Gimbel, Reilly, Guerin & Brown is honored to have so many of its attorneys recognized each year this issue comes out as being top lawyers in the Milwaukee area. Milwaukee, WI — The Milwaukee, Wisconsin based trial and litigation law firm, Gimbel, Reilly, Guerin & Brown (GRGB) is proud to announce that the firm came in first place in the Shepherd Express’s “Best of Milwaukee” 2017 contest in two categories: Lawyer-Business and Lawyer-Estate Planning. The Shepherd Express started the Best of Milwaukee contest back in the early 1990s and remains the city’s largest “best-of” contest as ranked by the number of voters. All winners are selected by people of the city.